The PTWS 4000 contains 6 off USP/EP glass vessels for a total volume of approximately 5 ltr. and 2 extra 1 litre vessels to take a Blank and/or a Reference Standard. It can also handle 1 and 2 ltr. USP/EP vessels using the same mono shaft stirring tools. The PTWS 4000 is an ideal instrument for either manual sampling or basic automation. 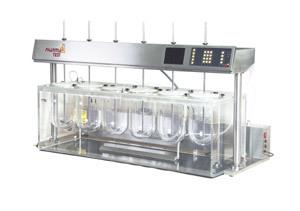 The "six-in-line" vessel configuration means easy access to the samples for subsequent analysis. Its automated lift-up system moves the drive head into an upper position to remove vessels, allow easy cleaning etc. The U-shaped water bath is separate from the main frame of the instrument and the built-in circulation pump is spring loaded assembled so the transfer of vibration is minimal. The system has a RS232 interface for remote control and data transfer to the PT-DL1 Data Logger to print information of actual stirrer speed and bath temperature. Also a pH probe and temperature sensor connection is attached for inline reading inside the vessels. This instrument can also be programmed to start up automatically before the start of the day so that bath temperature and vessel medium temperature can be ready for use first thing. Similarly the instrument can be programmed to shut off the heater at night. Direct connection to a Fraction Collector PTFC2 or other is also possible for automatic timed sample removal. The standard Testing Method Filing system eases the programming of sampling information.